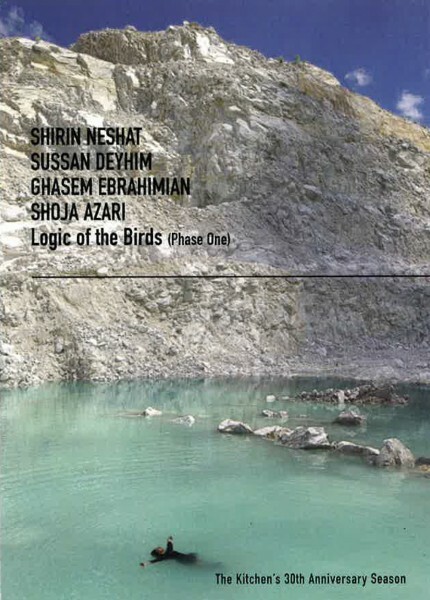 Logic of the Birds was a multimedia project and collaboration between four Iranian-born artists: the visual artist and filmmaker Shirin Neshat, the composer and performance artist Sussan Deyhim, the filmmaker Ghasem Ebrahimian, and the writer and filmmaker Shoja Azari. The project utilized a mixture of film, live performance, and music to follow a woman’s journey of self-discovery amidst explorations of the relationship between 12th century Persian mysticism and contemporary Iranian society. Deyhim acted as the primary figure on screen and on stage, where she was joined by thirty live performers in a performance that fused the characteristics of cinema with those of live musical theater. During the run, the four artists also took part in a TV Dinner, where they discussed a variety of issues related to the project in front of an audience, along with video screenings and a vegetarian buffet. An exhibition of paintings by the Iranian artist Shahram Karimi also took place concurrently in The Kitchen’s gallery space. The performances were almost cancelled due to the events of September 11, 2001, which occured a week earlier, but the artists decided to proceed given their belief in the importance of ensuring that artists can express their own cultures in their own voices.